Shopping for a Honda Accord near Walla Walla and College Place is easy when you visit Walla Walla Valley Honda. That’s because we stock both brand new and pre-owned Honda Accord models, spanning multiple generations. The Accord sedan made its debut on American soil in 1978, and it would establish this vehicle as a Honda flagship vehicle for years to come. To give our customers some insight on how the Honda Accord has developed over the years, what the 2015 Honda Accord is capable of, and what we can expect from future generations, let’s have a closer look at this sedan’s history. The first three generations of the Honda Accord saw a variety of changes, including a jump from hatchback to sedan and an increase in power across the board. First Generation (1976-1981): Launched on May 7th, 1976, the Honda Accord started as a three-door hatchback in Japan with an engine that produced 68 hp. Two years later in 1978, the Accord launched in the United States as a four-door sedan with updates to the transmission choices made accordingly. Second Generation (1982-1985): In 1981, the second generation Accord was the best-selling Japanese vehicle in the North American market. This generation also introduced a fuel injection system controlled by a computer, which was the first of its kind. Unique appointments for this generation Accord included shag carpeting, velour upholstery, and an auto-reverse cassette stereo. Third Generation (1986-1989): To give drivers a more comfortable, dynamic ride, the third geneation Honda Accord was the first Honda model to introduce double-wishbone suspension systems in the front and rear. The Honda Accord Coupe made its debut in North America, as well, and was quite popular. With an established global market, the Honda Accord continued to bring innovation to the industry with its reliability, familiar design, and significant engineering developments. Fourth Generation (1990-1993): Now much larger than the Honda Accord’s previous generations, the fourth generation Accord was built using Honda’s new CB chassis. This extra space made it a hit, along with the brand new aluminum 2.2L 16-valve engine. New options like the trunk-installed 6-disc CD changer provided additional control over in-car entertainment like never before. Fifth Generation (1994-1997): Using Honda’s CD chassis, the size of the Honda Accord grew even more for the fifth generation. The 1995 Honda Accord received its first-ever V6 engine, offered under the hood of the LX and EX trim levels of the sedan. In 1997, Honda released a Special Edition Accord trim level that included keyless entry, an in-dash CD player, and a sunroof. 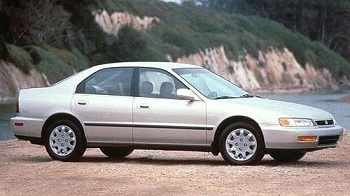 The 1996 Accord Sedan is known as one of the best-handling Japanese midsize sedans of all time. Sixth Generation (1998-2002): Only offered as sedan or coupe in North America, the sixth generation Honda Accord introduced a brand new 3.0L V6 engine as an available option for the EX trim levels. This powertrain produced 200 hp and 195 lb-ft of torque. It was mated to a standard automatic transmission instead of the usual 5-speed manual that other trims used. This generation also saw the introduction of the 6-disc in-dash CD changer. The seventh, eighth, and ninth generations of the Honda Accords were made larger than before to make them a competitive, family-friendly options for drivers in the North American, Japanese, and European markets. 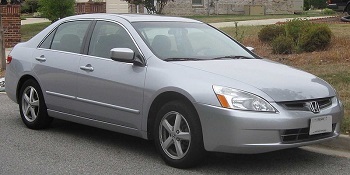 Seventh Generation (2003-2007): Distancing itself from its Japanese and European counterparts, the seventh generation Honda Accord in North America was the largest Accord yet. A Honda Accord Hybrid was introduced for the 2005 model year, while significant performance upgrades were seen across the board for this generation. Eighth Generation (2008-2012): Classified as a full-size sedan by the EPA, the eighth generation Honda Accord saw a dramatic redesign with a new front fascia that featured chrome accents on the grille flanked by headlights that tilted slightly upwards for a more aggressive look. Engines included a more powerful 2.4L I-4 rated at 177 hp, and a new 3.5L V6 that generated 272 hp. Ninth Generation (2013-Present): Considered the most technologically advanced Honda Accord to date, the ninth generation Accord offers drivers a choice between a coupe, sedan, hybrid, or plug-in hybrid model. A MacPherson strut replaced the front double-wishbone suspension for added ride stability. 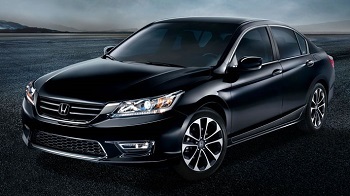 Best of all, every Accord model comes standard with an 8-inch display screen and a rearview camera. Drivers can expect big things from the 2016 Honda Accord, since it will undergo a refresh both inside and out. LED taillights are anticipated to come standard, while the EX trim and above will feature remote engine start, LED fog lights, and an HD-radio tuner. The Touring trim is rumored to offer heated rear seats, the Honda Sensing suite of advanced safety technologies, and new parking sensors among other options. If you’re in the market for a new or used Honda Accord near Walla Walla or College Place, check out our extensive inventory at our dealership today. 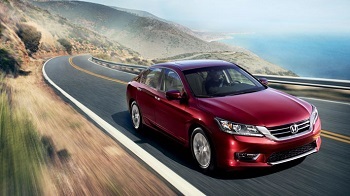 Visit our showroom at 1240 SE Commercial Drive in College Place to experience all the Honda Accord has to offer. Give our sales team a call at 509-593-4719 to schedule a test drive before visiting.